Brave and Happy: No Conflict? No Innovation. Know Conflict? Know Innovation! No Conflict? No Innovation. Know Conflict? Know Innovation! Karen Valencic said, "Without conflict, there is no innovation." Indeed, we tend to make our greatest innovations when we are left with no choice but to do something different. 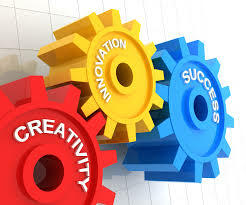 If the "different thing" works, it is an innovative success! If the "different thing" does not work, do we still call it innovative??? I think we should. What about those who operate on the edge and do new and different things on a regular basis? What about the trendsetters? Where is their conflict? I believe it comes from their passion and their relentless pursuit to improve. Even when a lesson goes well, these are the folks who push to do better. They may find a new app that will increase student engagement and focus student dialogue on the learning target. They may create a new project for students based on a neighborhood problem. They may ask the questions that nobody else asks. They are the ones who constantly challenge the TTWWADI mentality. They might even cause a few folks to shake their heads in disbelief. These teachers first moved their desks out of rows and into small groups so that kids could collaborate. It is almost a challenge to find desks in rows in 2015. These are the same ones who first tried teaching kids to read in small groups with appropriately leveled texts. Twenty years ago, these teachers were trendsetters. Today, guided reading is the norm. These trendsetters wrote grant proposals to buy iPads for their classrooms way back in 2010 so their students could access relevant and timely information globally, rather than from outdated encyclopedias. These days, educators are fully aware that technology needs to be in the hands of students! Teachers who make things happen find their own conflict. Unlike folks who cringe at the thought of conflict and change, these passionate educators smile at the challenge of doing things differently! They relish the thought of doing something better! They innovate!